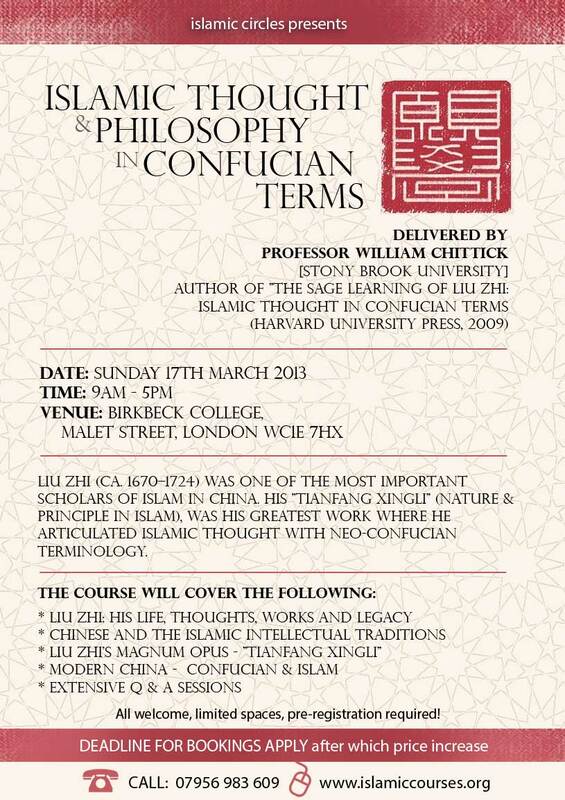 Delivered by: Professor William Chittick [Stony Brook University] Author of “The Sage Learning of Liu Zhi: Islamic Thought in Confucian Terms (Harvard University Press, 2009″. In the seventeenth century, Chinese Muslim ulama (religious scholars) realised that the Islamic worldview was in danger of being lost. In an effort to preserve the teachings of Islam in his native language, Wnag Daiyu wrote Zhengjiao Zahenquan (“The Real Commentary on the True Teaching”) in 1642. Over the next two hundred years, they published numerous books in Chinese and established a school of thought that came to be called the Han Kitab (that is ‘Chinese Books’). Far from being a polemical defence of Islam, this school attempted to show how Islam and Confucianism are two harmonious branches growing from the single tree of prophecy and sagehood. 15 years ago Professors Murata and Chittick began studying and translating the first of these texts, Tianfang Xingli (“Nature and Principle in Islam”) in collaboration with Tu Weiming, Professor of Confucianism at Harvard and Director of the Harvard Yenching Institute. Although the text is thoroughly Chinese and thoroughly Confucian, it is based squarely on the late synthesis of philosophy Sufism that is known as Irfan in Iran. Liu Zhi (ca. 1670–1724) was one of the most important scholars of Islam in China. His “Tianfang xingli” (Nature and Principle in Islam), was his greatest work where he articulated Islamic thought with Neo-Confucian terminology. Professor William C. Chittick’s research focuses on pre-modern Islamic intellectual history and its relevance for contemporary humanistic concerns. Born and raised in Milford, Connecticut, William C. Chittick did his B.A. in history at the College of Wooster (Ohio) and then went to Iran, where he completed a Ph.D. in Persian literature at Tehran University in 1974. He taught comparative religion in the humanities department at Aryamehr Technical University in Tehran and, for a short period before the revolution, was assistant professor at the Imperial Iranian Academy of Philosophy. He returned to the United States in January, 1979. For three years he was assistant editor at the Encyclopaedia Iranica (Columbia University), and from 1983 he has taught religious studies at Stony Brook. Chittick is author and translator of thirty books and one hundred-fifty articles on Islamic thought, Sufism, Shi’ism, and Persian literature. His more recent books include In Search of the Lost Heart: Explorations in Islamic Thought (State University of New York Press, 2012), The Self-Disclosure of God: Principles of Ibn al-`Arabî’s Cosmology (State University of New York Press, 1998), Sufism: A Short Introduction (Oneword, 2000), The Heart of Islamic Philosophy (Oxford University Press, 2001), The Elixir of the Gnostics (Brigham Young University Press, 2003), Me & Rumi: The Autobiography of Shams-i Tabrizi (FonsVitae, 2004), and Science of the Cosmos, Science of the Soul (Oneworld, 2007). He is currently working on several research projects in Sufism and Islamic philosophy. 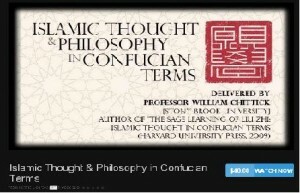 Chittick regularly teaches Islam, Islamic Classics, and other courses in religious studies. On occasion he directs qualified students in the reading of Arabic or Persian texts. For William Chittick’s Chronological List of Publications, click here.